I've been amped to get this one out during the week Army plays Fordham - a very nice digitized yearbook courtesy of Fordham University Library Digital Collections. I will buy that it is an important game for Fordham, and it's an important game for the sport in NYC - but considering the game will be well attended, I think the extra rivalry hype is not needed. Reviving the Rivalry! Not a rivalry... but I still want one of those limited edition T-shirts. Starting in 1891 the series is ancient, but it is far - FAR from a rivalry. Army and Fordham have only played twice with Army winning the first in 1891 and winning more recently in 1949. So, it's not a rivalry in any sense, but it is must-see. New York city football fans are jumping at the opportunity to see its two closest in-state teams play head-to-head. Fordham's history is full of great college football lore. From Fordham's great early teams to the Seven Blocks of Granite; through a period of football de-emphasis to the late 60's re-development of Rams football and up to and including Fordham's recent commitment to Rams football. Through all decades, the story is the same: As goes Fordham Rams football - so goes the state of college ball in New York City. 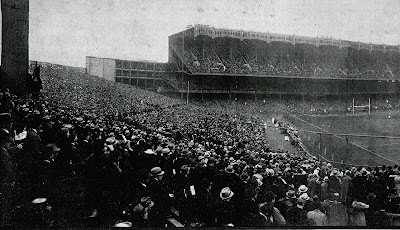 Fordham played in the 1941 Cotton Bowl and Fordham was invited to the 1942 Rose bowl but had already committed to play in that year's Sugar Bowl. 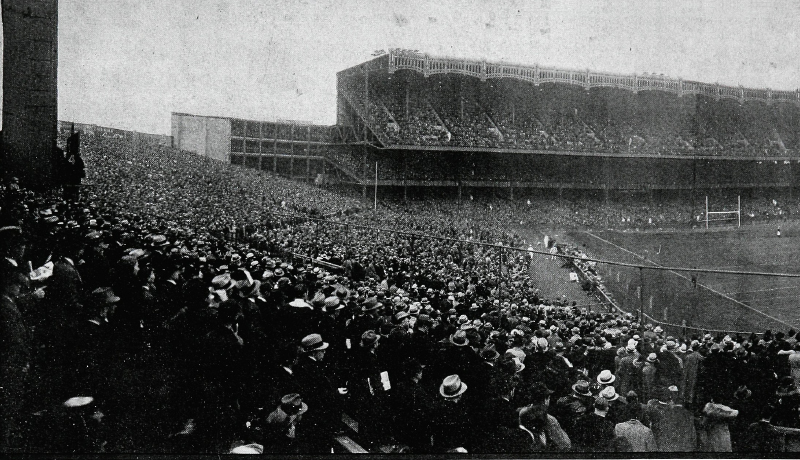 The following 1942 season would be Fordham's last at the game's highest level. The Fordham football program was dismantled during World War II and returned in diluted form in 1946. A sentimental piece about the last chapter of those great Rams teams (PDF) can be seen at LA84, whose magnificent repository of digitized texts I can't wait to dig deeper into. Fordham largely struggled in these post war seasons, but did achieve an 8-win one-loss season in 1950 their only loss that year being a 14-21 loss to (6-3) Yale at New haven. Fordham University Libraries have done a great job digitizing and making available the Fordham Maroon yearbooks. The search function is serviceable and the scans are clear - one usability note: for some reason I found it a lot easier to use the search function in Firefox so I will recommend Firefox browser for this site. The main flaw of this collection is that it is only complete through 1941. This gives us a great look at some of Fordham's best seasons - but it leaves obscured a lot of the whys and whens of their decision to step away from the game. Thankfully the same library digital collections unit put out full editions of Fordham's two student newspapers: the Observer and the Ram . In these we can glean more about the state of Fordham before de-emphasis. I'll add the Observer and the Ram to the Library tab and of course the Maroon makes it to the yearbooks list. Fordham baseball has a history equal to their football -this past season being the 151st season of Rams Baseball. Fordham's past is full of great players, historic games and legendary icons. Hopefully everyone, not just Fordham fans will take an interest in these resources. Another amazing and welcome addition to the yearbook collection: the Fordham Maroon.